Is your family ready for a “Zombie Apocalypse”? Have you created a disaster plan for dealing with a slow-moving (or, depending on your viewing habits, fast-moving) mass of undead, brain-eating, B-movie extras? If an unstoppable horde attacks, who’s in charge of gathering supplies? Who rounds up the family dog? Who rescues critical reference material? The Navy wants you to be ready — if not for zombies, then for other, less-fictional disasters like hurricanes or tornadoes. And it’s hoping a contest prompting Navy kids ages 5 to 17 to prepare an “escape plan” will pass that message of preparedness throughout the household. 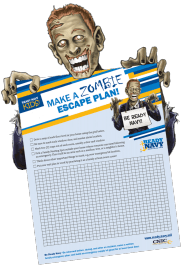 The Ready Navy Kids challenge asks for a video, drawing or written-out plan, developed by your child, for how your family will react when the undead come calling. Details and an entry form are here. Last year’s winning entries, which helpfully include drawings of a few weapons of choice for dispatching the zombie threat, are here. The contest is open through Nov. 15. Winners will have their designs or videos posted on the Ready Navy site. A written-out plan of action for when disaster hits. Communication plans so all family members can be contacted, and meeting places, both inside and outside of your neighborhood, in case the horde emerges disaster strikes while family members are apart. An emergency supply kit with three to five days’ worth of food and other essentials for each family member. Get more readiness tips from Ready Navy’s Twitter account.